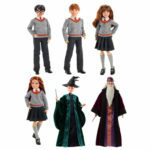 This film-inspired doll brings Harry Potter and his friends back to Hogwarts! 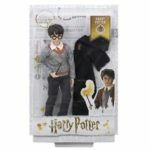 Young fans can recreate their favourite scenes from the movies, or imagine their very own, with Harry Potter dolls. 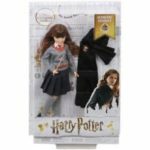 Each set comes with a six-inch doll and animal friend, a large set accessory, and themed piece-count. Choose from Bren Bear doll and Snore bear preparing for sweet dreams in the bedroom, Felicity Fox doll and Flick fox playing on a tree swing, or Bree Bunny doll and Twist bunny cooking up fun in the kitchen. Choose from three favorite Enchantimals dolls and their animal-besties, each with a unique theme. Each set (sold separately) comes with a six-inch doll wearing colourful outfits and accessories, an animal friend figure, a large set accessory, and themed piece-count. Bren Bear and Snore bear are cozy in their sleeping hats and ready to snuggle in their bedroom set! After Bren Bear doll is done at her vanity, place her into bed and cover her with a blanket. Felicity Fox doll and Flick fox are ready for outdoor adventures at their tree swing set! They are wearing their explorer hats and prepared with accessories like a backpack and map. Bree Bunny doll and Twist bunny are wearing chef hats and ready to cook up fun in their kitchen set. Use the pots, pans, and spatulas to “cook” at the kitchen counter (complete with a stovetop, sink, and refrigerator). 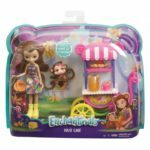 Spacks, inspired by the world of Enchantimals™, are positively enchanting with a six-inch doll, animal friends, and accessories to create a fun scene. Each Enchantimals™ set celebrates the lovable girls who live in the forest — these girls are always found with their animal besties and look like them, too! 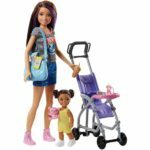 It’s time to go for a walk with this Barbie Skippers Babysitter Stroller Playset. There comes a moment in every mermaid princess’ life when it’s time to shine — and this is that moment! 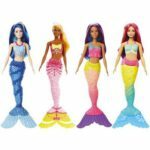 These mermaid dolls cannot hide under the sea with their gorgeous tails and shiny fins. Choose from Barbie doll in pretty, popping pink, Summer doll wearing brilliant, beautiful blue and Teresa doll rocking vibrant, vivid violet. 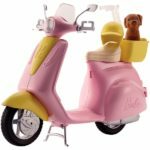 Scoot into fun with this Barbie moped. It comes with a pet friend who’s always ready to ride! Designed in pink and yellow with silvery accents, the moped is trendy and stylish. 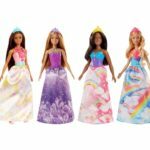 Each Barbie Fashionistas™ doll has her own look and style – from camo ruffle to shimmery rainbow stripes, all of the fashions are inspired by the latest trends! Collect them all to explore countless looks. 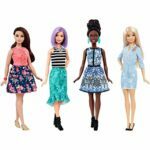 The latest line of Barbie Fashionistas™ dolls includes four body types, 10 skin tones, 12 eye colors, 12 hair colors, 12 hairstyles and so many on-trend fashions and accessories!